As Michiganders, we know that the winter months can bring unpredictable weather. Lately Mother Nature has been gracing us with frigid temperatures, ice and snow. Well, don’t let that cold weather freeze up your outdoor exercise routine. Exercising outdoors helps you clear your mind, recharge, and get in touch with nature. Whether you’re blazing the trails with your snowshoes or starting a training program for that 5K in the spring, use these helpful tips to stay safe and warm when exercising outdoors during the cold winter months. Plan for the weather. Take a look at the weather forecast before you go out and plan accordingly. Protect your body and layer up. Dress in layers so you can take off a layer when you get too warm, or put on a layer if you start to chill. Consider purchasing cold-weather synthetic compression clothing to wear as a base layer. The synthetic material wicks away sweat, keeping it off of your skin. Be sure to wear thick gloves and thermal socks. Also, a hat that covers the ears can prevent the heat from escaping through the top of your head and protect your ears from the wind and bitter cold. You may want to consider using hand and foot warmers. 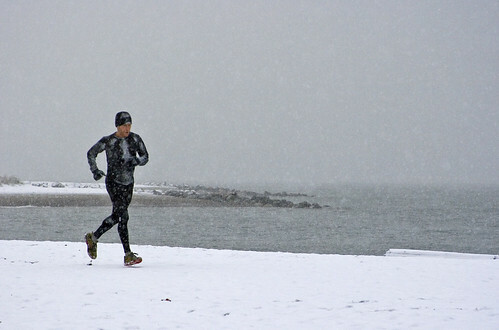 Check out our guide to choosing cold-weather running gear. Wear the right gear. Remember, our daylight hours are shorter during the winter months. Choose reflective clothing or wear reflective accessories so other individuals, especially drivers, can see you. Make sure you’re wearing shoes with good traction so you’re less likely to slip on ice and snow. Stay hydrated. Dehydration can occur in the cold weather too! Be sure to drink plenty of water. If you’re going to be out for 45 minutes or more, consider a sports drink to replenish what you’ll lose from sweating and breathing. It’s important to stay hydrated before, during and after your workout, even if you don’t feel thirsty. Know the signs and symptoms of frostbite and hypothermia. Frostbite is most common on exposed skin such as cheeks, nose, and ears. Early warning signs are numbness and stinging. If you suspect frostbite, get out of the cold immediately and warm the affected area. Hypothermia signs and symptoms include shivering, slurred speech, loss of coordination and fatigue. Seek emergency help right away if hypothermia is suspected. Go with the wind. If at all possible, try to do the second half of your workout with the wind at your back. This way you’ll be less likely to get chilled if you’ve been sweating. Wear sunscreen. Sunburns can occur even during the winter months! A sunscreen with at least 15 SPF should be used on exposed skin. Also, consider using a lip balm with a sunscreen and protect your eyes from the glare with dark glasses or goggles. Check with your doctor. Cold weather can have a negative effect on medical conditions such as asthma, Raynaud’s disease or heart conditions. Always check with your doctor before beginning an exercise program. What do you do to stay warm and safe outdoors?